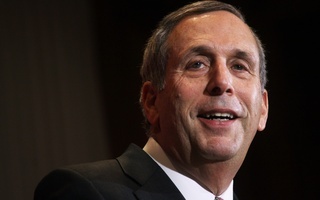 University President Lawrence S. Bacow returned to Washington, D.C., for the second time during his presidency to lobby federal lawmakers and a White House staffer to increase research funding, bolster immigration protections, and avoid another government shutdown on Thursday. The meetings come on the heels of the longest partial government shutdown in U.S. history. The 35-day shutdown left more than 800,000 federal employees either furloughed or forced to work without pay, caused funding lapses, and restricted access to resources used by some Harvard faculty members and graduate students. “I've talked to them about research funding issues — the importance of continued NIH and NSF funding — trying to get a two-year budget deal so that we don't find ourselves with a sequester again,” Bacow said. Bacow met with several lawmakers from the House and the Senate across the political spectrum, including U.S. Senators Mitt Romney (R-Utah), Lamar Alexander (R-Tenn.), and Roy D. Blunt (R-Mo. ), along with Rep. Jim P. McGovern (D-Mass.). Bacow also spoke with Kelvin Droegemeier, the White House’s director of the Office of Science and Technology Policy. McGovern wrote in an emailed statement that he was appreciative of Bacow’s visit and is excited to work with him moving forward. Spokespeople for Romney, Alexander, and Blunt did not respond to multiple requests for comment. In past visits to Washington, Bacow met privately with legislators like Senate Minority Leader Chuck E. Schumer ’71 (D-N.Y.), U.S. Senator Michael D. Crapo (R-Idaho), and U.S. Senator Edward J. Markey (D-Mass.). This trip marks Bacow’s first journey to Washington since the U.S. House of Representatives flipped from Republican to Democratic control in January — a shift that Bacow noted did “change things.” Bacow said, however, that the new Congress hasn’t “really changed” his lobbying strategy in Washington. 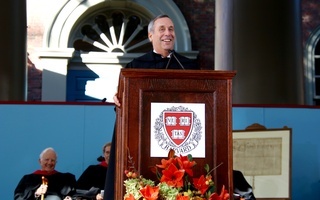 Similar to previous visits, Bacow lobbied against an excise tax on some universities’ — including Harvard’s — endowment returns that will likely cost the University between $40 million and $50 million per year. He also made the case for continued research funding and for protections for students in the Deferred Action for Childhood Arrivals program — an Obama-era measure that allows undocumented youth to live and work in the United States — and workers with Temporary Protected Status. 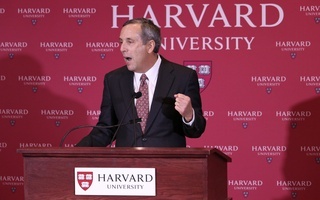 Regarding the endowment tax, Bacow said that “it’s difficult to predict at this point” the future of the tax. The University previously stated that they hadn’t yet received guidance on how to file its taxes with the new levy in place. 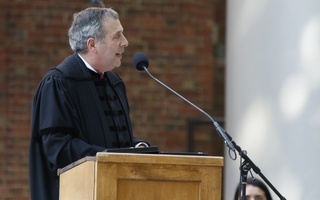 As of Thursday, Bacow said that was still the case, though the University still has a few months before it needs to file that particular tax for the first time. “We are still awaiting final regulations from the Treasury Department,” he said.